To launch their new ‘Sports Apparel’ range, Superdry teamed up with Stylo to create their September windows. Consisting of green vinyl battens interspersed with LED lights the scheme also features the brands new ‘Superdry Sport’ logo. 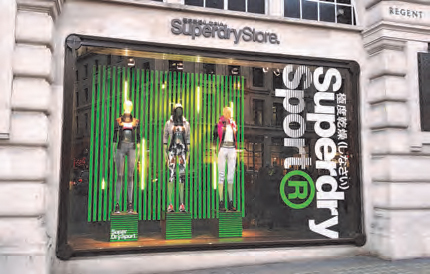 Produced by Stylo, the scheme can be found at Superdry’s UK store on Regents Street as well as in stores across Europe and in New York’s Times Square.